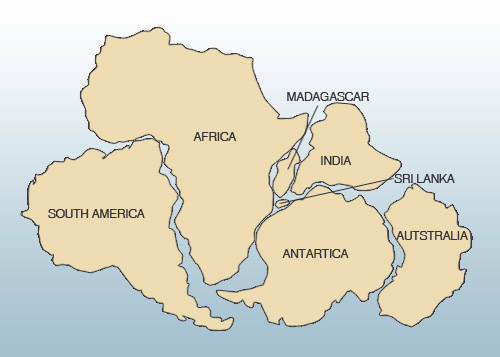 This Map shows how close these countries were 165 million years ago. The making of a natural Sapphire & Ruby No one is exactly sure how long ago sapphires and rubies were formed. 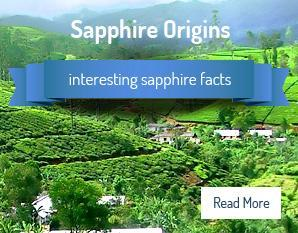 But we do know that the sapphires which are found today were formed around 150 to 200 million years ago. Today the modern location of rubies and sapphires gives us some clues and indications about the place of their formation. The main deposits of high quality sapphires and rubies are found only in a few places, mainly southern Asia and eastern Africa and the islands of Sri Lanka ( Ceylon ) and Madagascar. The answer as to what took place inside the earth to form these gems and then transport them to the surface varies from country to country, but the story remains the same. At some point, millions of years ago, source rocks inside the earth’s crust were subjected to intense pressures and high temperatures, causing the atoms to recombine into new metamorphic (changed ) rocks which included rubies and sapphires ( corundum ). Later the moving crustal plates and erupting volcanoes carried these rocks to the surface. 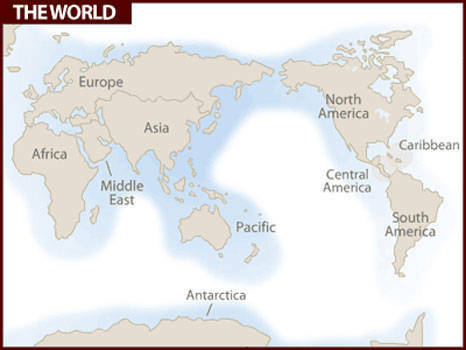 Map of the world Today. The details change in each country. Some rubies and sapphires are found in high-grade metamorphic rocks and in igneous rocks, called gneisses and granulites, located in Sri Lanka, India, Madagascar, and eastern Africa. In most cases, they formed at depths of 6–18 miles in the earth’s crust, as intense pressures and high temperatures above 800 degrees transformed sedimentary (“water deposited”) rocks, such as siltstones and shale. The best rubies, however, are found in marbles, particularly at mines in Myanmar ( Burma ) but also in Vietnam, Afghanistan, Pakistan as well as Nepal. These marbles formed when heat and pressure inside the earth changed, or “metamorphosed,” soft limestone into metamorphic rocks. You can see on the maps above how these deposits, over millions of years, were forced from the upper earth’s mantle to the surface. 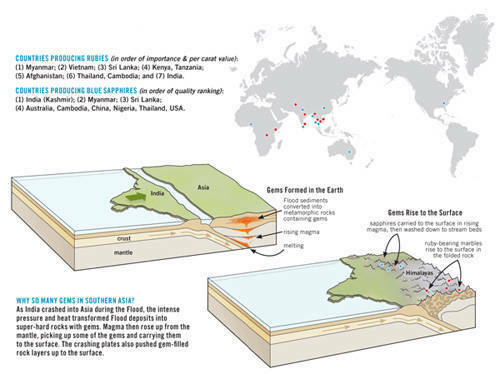 The most famous deposits of corundum-sapphires ever to be found, are from deposits in Kashmir, Burma and Sri Lanka (Ceylon ) in the illustration above you can see how India was pushed along into the Asian continent . As India was pushed inwards into Asia, the Himalayas were slowly created and the corundum was pushed upwards over millions of years as streams and rivers were formed and the metamorphic and igneous rocks were worn away revealing the corundum ( Sapphire's & Rubies). Below is a crystal of rough corundum you can see how corundum comes in many different colors and depending on what was naturally present millions of years ago gives each stone is unique color and beauty. . Rough Pinkish corundum- sapphire weight 19 ct's.